So glad to have my horse back! This past Nov, my horse Cisco broke his right hind coffin bone. Nasty break up into the joint, multiple pieces, etc. Which then promptly got infected. Cisco was spending most of >80% of the day laying down in his stall licking his hurt foot. My colleagues that I contacted that specialize in equine orthopedics were less than optimistic. The topic of surgery was tossed around. Most thought he wouldn't ride again. In the end, I opted not to take him to surgery given the exceptionally high complication rate and the likelihood that it wasn't going to change the outcome. TONS of antibiotics. Corrective shoeing. Stall rest. Suppliments. Lots of nursing care. In Jan, *months* before anyone had anticipated, he was cleared to go back to pasture. And in Feb, he was cleared to ride. By March, he was cleared to go back to jumping. None of us had expected to even have him fully back out to pasture by March! Cisco has been doing wonderfully. Decided to enter him in a show the first weekend of May. Let him take it easy and see how he held up. After a lot of adjustments to his corrective shoe (to make it legal for USEF regs), he destroyed the shoe after we arrived on show grounds. But he stayed sound and so I showed him. My pony is back! He had beautiful rides. Only rode him in four classes over the course of the show. But he felt amazing. He was still a little tightly wound during his first SHUS class but still managed to take second in a decent sized deep class. He took first in his other SHUS class (again a good sized deep class) and first in both of his HP classes (not as big of classes, but some nice horses). He even warmed up one day with the hunter hack horses and had no trouble with the jumps. Yeah! So excited to have my boy back. Looks like we'll be headed to Regionals after all. And if he continues to stay sound with increased jumping, Nationals might not be completely out of the question this year. Not bad for a horse that we weren't sure would live through his injury! This post needs a "Like" button. He did heal fast. And well. Way faster and better than any of our expectations. I'd had several conversations with the steward prior to the show about his shoe. USEF had already ruled on it, but needed to make sure everyone was on the same page. She stopped by the stalls the day we moved in to take a look at the shoe in person (what was left of the shoe, that is). She asked me if I was sure he was ready. I told her I was sure (and so were several equine orthopedic surgeons). 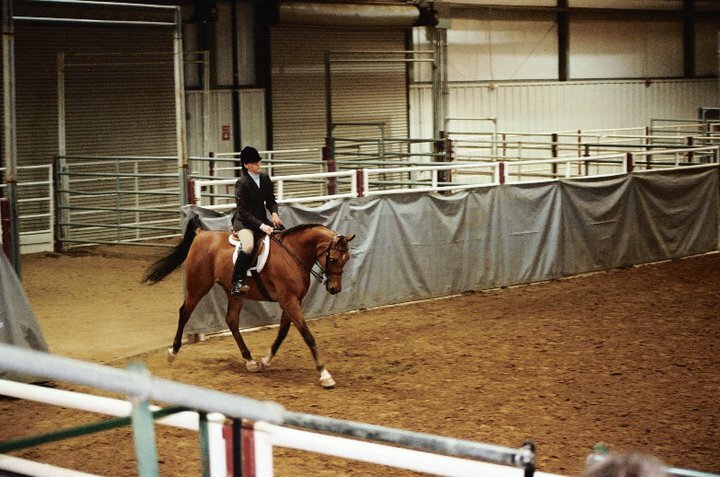 After our first class, she caught me as I was leaving the ring and told me that my horse was most definately ready...and was worth all the time, effort, and money that I'd put into getting him healed. Made my day. It was a busy show and didn't get much in the way of photos. But I have to share this one that a friend of mine caught at the beginning of a SHUS class. Cisco was so happy to be back doing his job...and I thought this photo really captured that. Brought me to tears after reading the story, then seeing the photo. What an amazing story, well what an amazing HORSE! He is lucky to have you. This was a great story, thank you for sharing. Subject: Re: So glad to have my horse back!